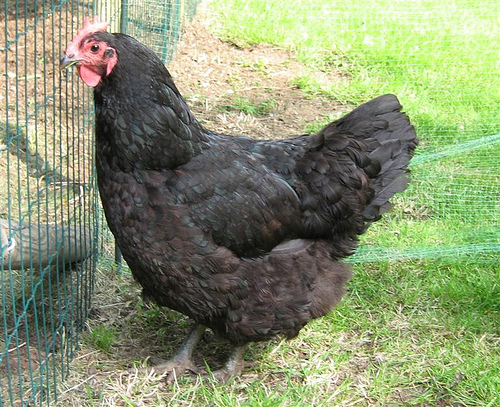 This breed originated in Australia developed from Black Orpingtons imported from England; and the emphasis of the breeding program was on egg production without sacrificing too much in size and meat quality. Some sensational results were made in the Australian program, and one hen set a laying record of 364 eggs in 365 days. Introduced into this country in the 1920's, they have become useful and popular and are certainly one of the best layers of light brown eggs of all the heavy breeds. A flock ofBlack Australorps have glossy black plumage which has a greenish-purple sheen. They are big birds, cockerels weighing 6 to 8 pounds at maturity and pullets 5 to 7. They have a pinkish white skin and plump bodies which dress out nicely once the birds have their final plumage. Pullets mature early and many will be in production between 5 and 6 months of age. They are quiet, gentle, and stand confinement well. Baby chicks are black with a good deal of white in the underparts and small white patches around the head and wings. We have handled this breed for years and think it is one of the best of the heavy breeds.